Prom dresses. Prom queen fit for your 2016 Prom theme. Make your Prom memorable for a lifetime. We have several Debutante, Cotillion, Quinceanera gowns and Sweet 15 & 16 Dresses. Evening, quinceanera and Prom dresses. Click on photo for more information. 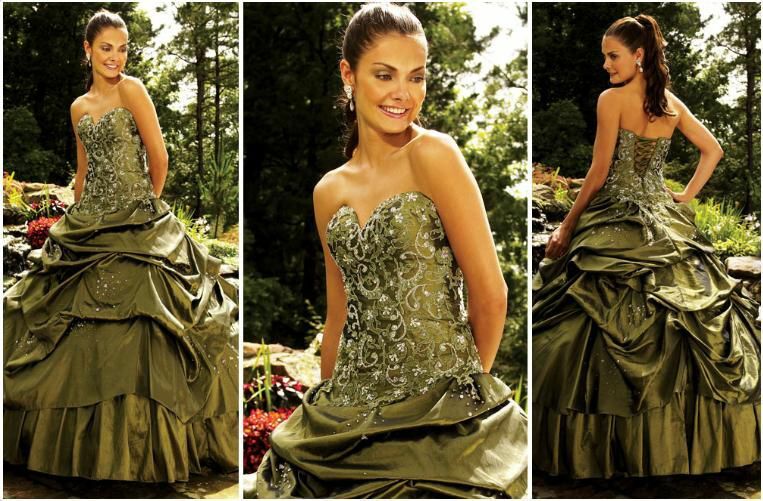 This strapless quinceanera dress has a fully beaded bodice and a full ball gown skirt. The skirt is accented with an elegant beading design. The back of the dress is fashioned in a corset lace up style. Available in Taffeta shades of pink: Bubblegum, Pink Blush, Raspberry Fushia, Rose Petal or Watermelon. This spaghetti strap quinceanera dress has a tulle ball gown skirt and a beaded bodice. The over skirt is accented with bead work as is the underskirt. Available in many shades of blue and orange including: burnt orange, apricot, coral, peach, tangerine, bright blue, navy and sky blue. Sweet Tulle ball gown with a more modest bodice with just tip of the shoulder capped sleeves and round neckline. The lace up back aids you in a custom fit. Beaded lace appliqués. Basque waist over the layered ball gown skirt with pick up feature and scattered appliqués. Vibrant Satin ball gown. Strapless sweetheart neckline with easy-fit lace up back. Overlay on bust with lace appliqués. Overskirt is gathered with lace applique on the off center dropped waist. Pick ups on the high / low over skirt and a gathered full ball gown skirt beneath. Beautiful contrast floral embroidery with beaded accents really set off this lovely Tulle ball gown. Strapless with a sweetheart neckline and lace up back to make for a custom fit. Figure flattering ruching on the dropped waist bodice. A stylized scrolling scalloped edge to the apron tier on the full ball gown skirt. Beautiful beaded Lace appliqués adorn the strapless sweetheart bodice on this Taffeta ball gown. Lace up back for a great fitting dropped waist bodice. Scattered beading accents the pick ups on the shorter tier over the ball gown skirt. Pretty Tulle ball gown with a strapless sweetheart neckline with ruched bust. Beaded embroidery adorns the drop waist bodice and gracefully drapes to the skirt. Lace up back helps you adjust the fit perfectly. The layered ball gown skirt has a sheer layer with beading accents.